The App and Play Stores are more competitive than ever. We detail a number of ways to make your apps stand out from the masses. In their 2017 retrospective, the people at App Annie reported the total number of downloads in the app store grew by 60% compared to 2015. Yes – sixty percent! Both the App Store and Play Store currently house about 6 million client-facing applications. How can we compete for users’ attention in such a vastly overcrowded market space? How can we get the attention of those users that are the most valuable to our product? And finally: how can we convert aware users into activated brand ambassadors? 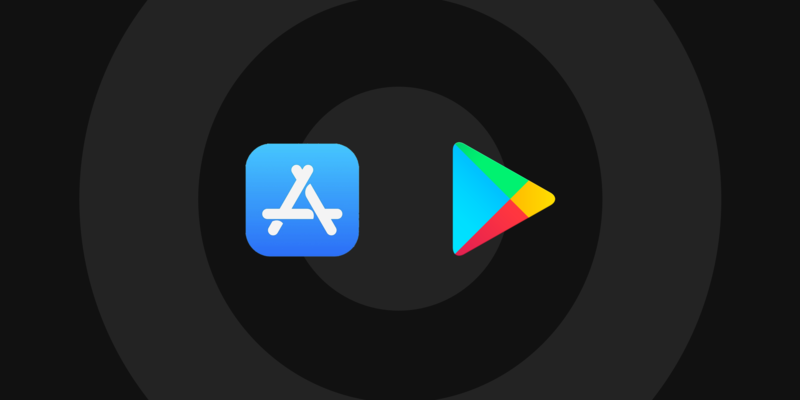 In our opinion (inspired by the people at Phiture), these three questions need to be answered if you want to qualitatively invest in App Store Optimization (ASO) activities and procedures. In this blog, we will highlight some of the core activities we can perform to improve the app store presence and convertibility. Before we can convince the most valuable cohort to download our product from the store, we need to actually get the product in front of their noses. We’ll present 4 methods that can impact the visibility of your product in the store. It’s possible for certain top performing products to get featured in the stores. Featured apps are promoted on the store’s opening screen – prime app store real estate! But what do they mean by “top performers”? Well… it’s not an objective metric. The local editors/managers of the stores handpick the products that get featured. This means that building a relationship with them is step one to getting your products featured in their respective stores, locally. And that last word is essential: the stores are managed locally, so a product that is available in several countries might only get featured in one. Make sure your products are as crash/error-free as possible. Make sure your products are updated frequently. Make sure you use all tools the stores offer to promote your product. While getting featured is subjective, getting to the top of the charts is a matter of numbers. Before going into details on how to get you there, let’s quickly look at the existing charts. Both the App Store and the Play Store have three categories: top apps (general), top selling apps and top free apps. Being top of the charts, again, is a local phenomenon. As always with top charts, a lot depends on periods of influx. During a limited period, a lot of people need to download the product for it to get into these charts. These download spikes tend to go hand in hand with so-called ‘burst campaigns’. During these campaigns, users are approached throughout a number of channels to go to the stores and download the app. Often, they are enticed by a deal, prize or vote they will get once inside the app. However, there is an important downside to such campaigns. They work, but they don’t convert the right people to use the product. Users collected through burst campaigns tend to use the product once – for that specific boost-related feature – and they disappear again. Our advice? Use the force wisely ;) Invest in campaigns that revolve around the core value of the product – don’t just invent an incentive to attract users. The previous two activities we talked about are push-based procedures, aiming to get the product in front of the masses. However, it’s also crucial to cater to the right people: the ones who are already motivated to find our product. Don’t forget that people still search the stores for an app that answers to their needs. They can do so in two different ways: search directly for a particular product, or more generally search for any product that can solve their problem. Both search strategies can be catered to by investing in Key Word Optimization (KWO). The basis of KWO is the observation that the success of a keyword is dependent on the correlation between two factors: Volume and Competition. The sweet spot: these keywords score low on competition but high on volume. These are the keywords that matter most to your specific product. They are unique and need to be capitalised on. 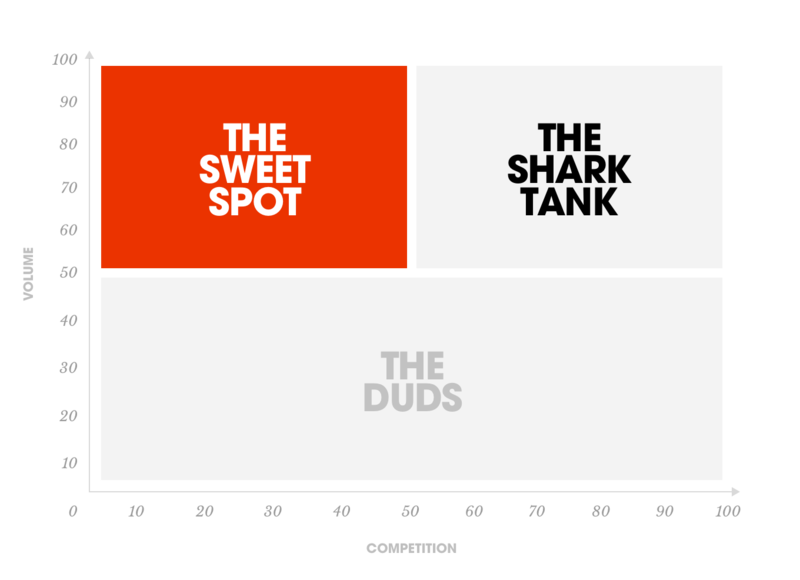 The shark tank: these keywords score high on competition and on volume. Consider these keywords carefully when selecting. If you know your product scores high within a specific category, these might be worthwhile. And because your position in the results list is also influenced by your app’s popularity, avoid selecting keywords in this zone for less popular apps. The duds: these keywords are dead in the water. They are low on competition but also low on volume. Especially in the App Store, where the amount of keywords is limited, including these is pointless. Keep in mind the difference between App Store and Google Play Store. In the App Store, you are limited to 100 characters for keywords, making a good selection critical. In the Play Store, there is no separate keyword field. Keywords are extracted from other metadata on the page (such as your descriptions). Instead of placing your ads willy-nilly on the store, you can link them to contextually relevant keywords. This means it’s best to perform your keyword optimisation exercise upfront: this will allow you to identify the most relevant keywords for your product. Based on those keywords, you can then target specific user segments that will see your product first once they search using that specific keyword. Most effectively, you can use search ads as a means to bypass the competition on those ‘shark tank’ keywords. Let’s use the VTM example again. The keyword ‘live’ has a high volume and scores high on the competition parameter. This makes it likely that our app will rank low on the list. However, by using search ads, a user will see our product positioned first, below the search box. Admittedly, they will see it’s an ad, but if you use it wisely, this technique can still land valuable conversions. Now, increasing the number of people that ‘see’ your product is only one piece of the puzzle. But to really compete, you must identify, target and convert the most valuable users for your product – not just pulling out the big guns for a “spray and pray” approach! But how do you define the ‘most valuable’ users? In short, users that convert and that can be retained are your target. In the current market, retention is the hardest part of the funnel – you don’t want users who install the product and then never use it again. There are a number of techniques and procedures that can reduce your churn rate, but qualitative retention starts with proper ASO. Let’s look at three methods that can drive conversion to the most valuable customer segment. The artwork that accompanies the submission of an application tends to be an afterthought for a lot of project teams. When the release has successfully been uploaded to the stores, often the PM or client quickly takes a number of screenshots with little regard for their impact. We believe there is a simple rule of thumb for creating store artwork: focus on the core value of the product. What are the features that consistently deliver value to the most important user segment. Going back to the VTM: on a regular basis, we add ‘voting’-based features. Although these features tend to convert a bunch of users in one go (and at times have ‘burst’ effect), many of these users aren’t easy to retain. They go through the motions of voting, but they are not engaged to consume long-form video – which is the core value of the product, in addition to driving the revenue model (ad-based). So what does artwork have to do with it? Currently, the stores allow you to add three types: feature graphics, screenshots and app previews (iOS only). These are one of the first things any user sees when landing on your application, and the first opportunity to communicate the core value of your product. So focus on the essentials – not on one-off or temporary features. They won’t give you the best users. Make sure your app title is long enough and try to communicate value with it. The store algorithms don’t like very short titles – use at least 7 characters. It also pays off to communicate the core value of the product in the title. For instance, the name “Graava” says very little; but the app’s product managers were wise enough to add “auto video editor” to the title. This increases retrievability and drives conversion of relevant users. Use the subtitle on iOS to drive conversion and increase visibility. Since iOS 11, you can add a subtitle to your product. Adding one has a double benefit. Firstly, the words you use there will be indexed and added to the algorithm, increasing the likelihood of users finding your products (with the right keywords). And secondly, it can clarify and drive conversion to the product itself. Write your app description in two tiers. Both on in the App Store and in the Google Play Store, the first 255 characters of the description are the most important ones. They will be shown by default – the other characters will only be shown once the user expands the view. Use short, catchy and to the point phrases to communicate the key features of the product. Again: focus on what’s essential and not on the nice-to-haves. Past the 255-character-mark, it’s all about writing for SEO purposes. Yes, SEO: because while words used in the app description will not be indexed or added to the algorithm on iOS (on Android they do count), Google does index them – and iTunes pages are ranked in the search engine, too. Good ratings and reviews are one of the most important aspects to driving conversion – but also the hardest to impact. Of course, you need to create an excellent, crash-free product, but even with a perfect performance, it might just not resonate with your users. Especially with radical product updates, users can react conservatively, longing for the previous versions they had grown accustomed to. So how can you have a positive impact here? Both iOS and Android offer functionality that prompts a review window while users are in the app. However, this can be perceived as annoying. Luckily, technology can assist us here. Michal Tajchert from Bluesoft has written a great article on using AI to predict when to prompt the review box. By using a beta feature of the Firebase stack (kindly offered by Google), you can predict whether users are likely/unlikely to churn within a specific period of time. You can also set the risk tolerance level. This means that within the group of ‘unlikely to churn’, you can focus on those users that are ‘very unlikely to churn’ by putting the risk tolerance level as low as possible. If you anticipate that a larger group of your audience will react well to the prompt, you can increase the risk tolerance level. Keep in mind that this can be managed on-the-go in the Firebase console, allowing you to finetune the risk tolerance until you see a positive effect. 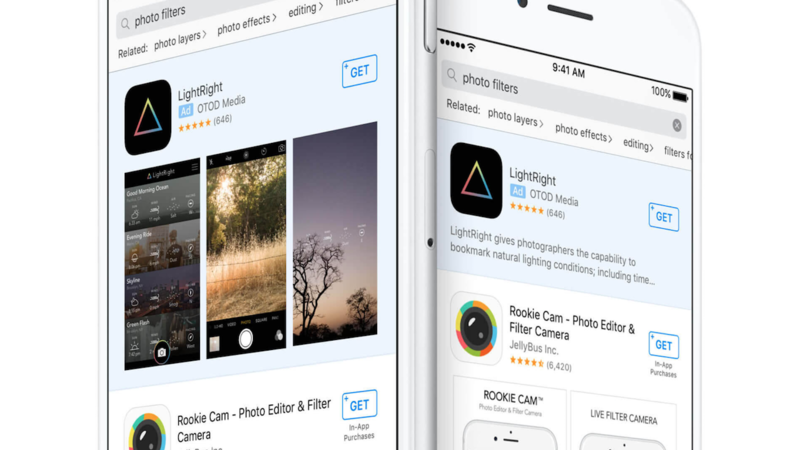 App store optimisations are a versatile process that can have real effects on your app’s visibility and conversion. By intelligently optimising your keywords, and communicating about core value, you can stand out to the most valuable users in the highly competitive app stores. However, it’s important you see ASO as an activity within a larger growth framework. ASO is no silver bullet to acquisition, activation, retention or referral. It’s a useful, small cog within a larger machine. It is up to you and the growth team (if available) to identify which activity is most valuable to grow your product. In certain cases, your ASO might already be up to scratch – meaning allocating more time, manpower and money there wouldn’t get you much further. In these cases, an activity like increasing retention curves in the product itself might be much more valuable for your app! In short: resources are scarce and there are thousands of activities to be performed to grow your product. Learn, select and experiment with those that work best – a shotgun approach with different techniques isn’t going to help you rise to the top.